Recently I received a beautiful wooden rattle to review. If you know me or read my blog you know I am a big believer in reused, recycled and greener products- especially for my kids. This rattle fit the bill in more ways then originally meets the eye. It is made by Earnest Efforts in Oregon, USA. These rattles have been in production for over 25 years and are a great, safe alternative to plastic. They are made from sustainably harvested Oregon woods and the owners tell me that no living trees are ever cut for their products to be made. This simple packaging of just a paper band wrapped around the rattle made me happy- really easy to ‘un-wrap’ and begin playing! What really sold me though was the fact that they took the extra step to safety by having their rattles tested in November 2008 for lead, phthalates and other toxins with x-ray florescence and they were found to not be contaminated. So you can be assured they are safe and appropriate for your child! Little Miss E loved the sound and while she can’t shake it on her own yet she loves to hold it and brings it up to her mouth but mostly loves when big brother shakes it for her and she giggles and reaches for it. I grew up believing that babies only liked the bright colored toys- after having two kids and going mostly green I am still amazed at the fact that babies and kids like just about any toy that has a neat sound or looks cool. As you can tell this is a natural toy and yet Miss E LOVES it. The sound is almost like a rain stick (do you remember those in music class in school?) if you slowly move it up and down but you can also shake it faster and it rattles nicely! While I received this rattle for free for this review I will be buying more for my sister’s new baby and a few other friends for Christmas gifts! I love them! I highly encourage you to check out Earnest Efforts and find a gift for a special baby in your life this Holiday season! Christmas Gifts Galore prizes are for Public followers of Mommy Moment. I want to reward my amazing followers for showing us so much support these past 8 months. To become a follower just click the “Follow” button in the sidebar – just below our fabulous sponsors. If you are not a public follower, you forfeit your entries. Leave your e-mail address in your comments so I have a way to contact you if you win! 5) Tweet the following: ” #win Natural Baby Rattle @ http://mommymoment.ca via @mommymomentblog #ChristmasGiftsGalore “. You can tweet twice a day at least 3 hours apart for (2 entries per day) Please leave the Twitter URL in your comment so I can verify. 8) If you earned Early Bird Entries just add them as early bird entry 1, 2, 3 etc – let me know your name so I can verify. Of course we would still LOVE for you to do the following, but they will NOT count as extra entries! This giveaway is open to CAN/US residents that are public followers of Mommy Moment. You have until November 22, 2010 to enter the giveaway. All entries will be verified to make sure they were done correctly or a new winner will be chosen! Winner will be chosen by random.org and e-mailed. The winner will then have 48 hours to claim their giveaway item by e-mailing mommymomentblog @ gmail.com. If the winner does not claim their prize within their 48 hour period, they forfeit their prize. *All entries received after the cutoff time will be deleted prior to choosing a winner. Disclosure: Mommy Moment was provided with a Natural Baby Rattle in order to test the products’ abilities and give our own personal opinions on it. The opinions given are that of the Mommy Moment reviewer and may differ from others but were not influenced by the company or the free product provided. Kristi’s blog is Creative Kristi where she writes about life, frugal living, crafts and cheap home renovations. She is a momma of two- a 3 year old boy and a 5 month old girl! Come Check out Hundreds of dollars worth of giveaways and some great gift ideas! I really like the Vine Maple Driftwood Box. It's so beautiful! I have the Mommy Moment button on my blog! 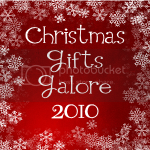 I have the Christmas Gifts Galore button on my blog! I like the Alder Driftwood Box. I love the black walnut drawers, wonderful work! I would love a Spirit Shaker for myself. Then the baby and I can jam together! I like the Myrtlewood Driftwood box. I love cedar and these are so pretty!